had been closed after the departure of the former head chef, Martin Bieri – in charge of this restaurant as from summer 2015 – and was not opened for the summer season. My last dinner with “Bieri” took place in his last season at the Seehof and as always I very much enjoyed it. At the time, I was of course unaware of the fact that I would not have the chance to relish his superb cuisine here again. All the more, I want to pay tribute to him by doing this review, although being late. Maybe some time in the future I will have dinner with this talented chef again at his new place of work, wherever it will be! 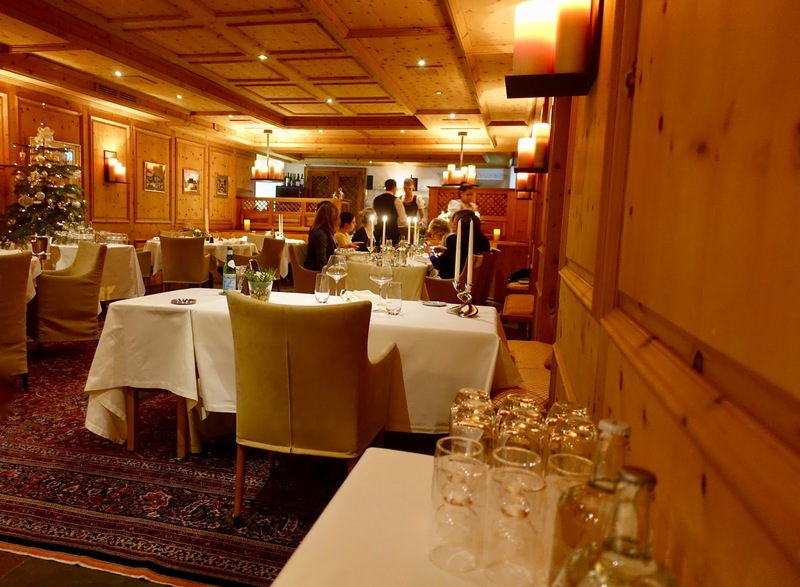 Gourmet Stuebli is one of several restaurants at the Seehof, one of Davos’ leading hotels. It is furnished in a cosy yet elegant style. The room, which is completely paneled in Swiss stone pine, comprises barely ten tables. You could choose between two menus: one featuring a rather classic cuisine named “Back to the roots” or a modern one, “Around the world”, which was Asian inspired. The menus had 7 resp. 8 courses, from which you could order all or parts of it. Martin Bieri has a strong affinity to Asian cuisine and I have the impression that this has been intensified over time. While at the beginning of his time at the Seehof there had been only isolated Asian touches, his cuisine in his last season – at the least the modern part of it – was heavily Asian influenced. This is all the more surprising as he never worked in the Asian area. Be that as it may, Martin Bieri knows in any case how to immaculately prepare an elaborate French-Asian fare. Here I would like to showcase the highlights of the last dinner I had with Martin Bieri together with my family and friends during his last season at Hotel Seehof. All of us chose four courses from the modern Asian inspired “Around the world” menu. which were a mix of modern Asian and traditional ones. A memorable nibble was the thinly sliced Asian vegetable salad with a rather spicy sweet and sour dressing. that compromised of three varieties and was accompanied by a tasty pumpkin seed pesto, ricotta with many herbs in it and flakes of a smoked artisanal butter. – I seldom manage of not ordering this dish when it is on the menu – and it was a great choice! 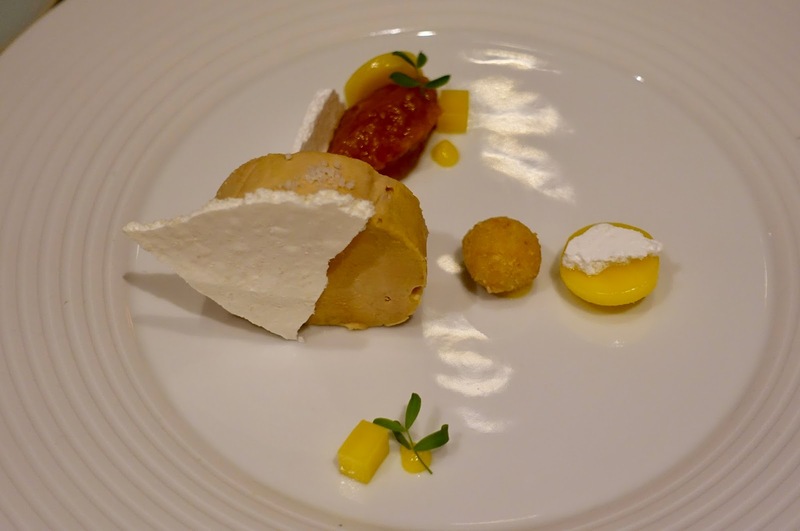 It came in combination with Thai mango, sake, plum wine, meringue and a dumpling filled with mango-kafir lime compote. What a great blend of French and Asian flavors! Each element balanced each other out perfectly both in terms of taste and texture. An exceptional dish was also my second starter, red mullet in Thai ceviche style. 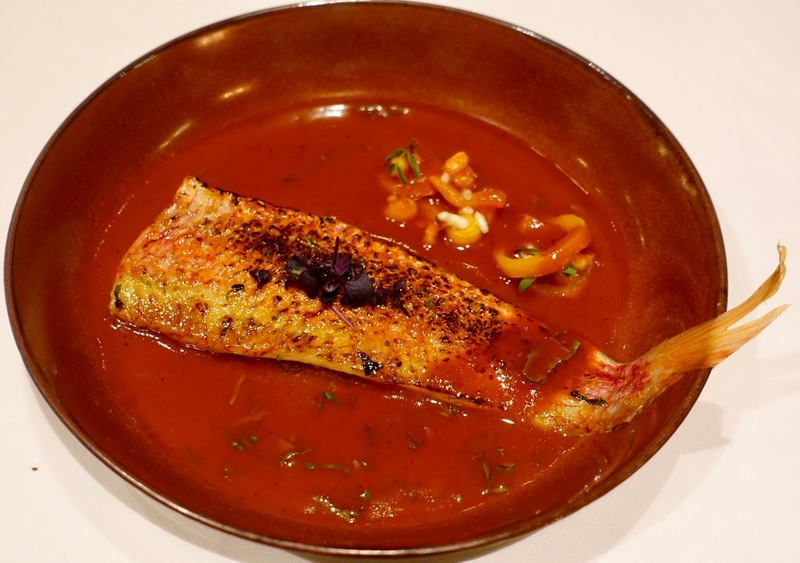 The fish, marinated with lime juice, red peppers, mint and ponzu, was seared and then a light sauce consisting of red peppers, fish stock and soy sauce was added. A fantastic Mediterranean-Asian melange! The last course I am going into is the main course, which was a duck variation. This was a very elaborate dish composed of a duck liver apple creme brulee, a tower with smoked duck, a piece of duck breast with its stock and a duck consomme. 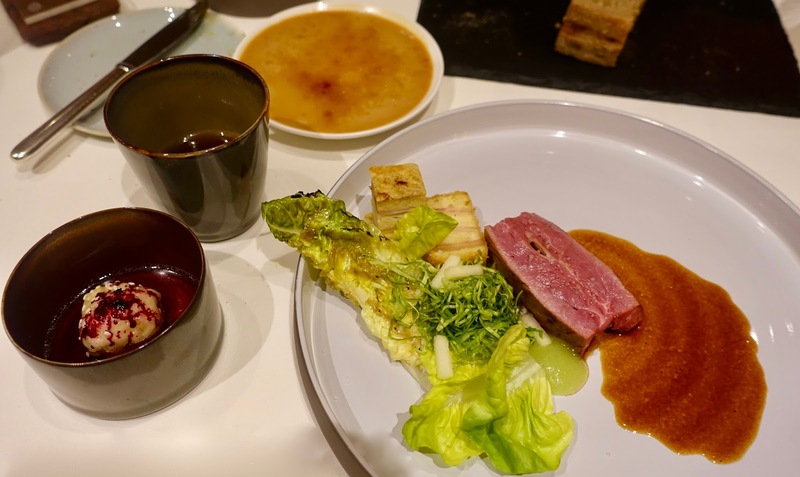 The duck arrangement was accompanied by lettuce, both hot and cold, and a dumpling. Such an inventive take on duck! 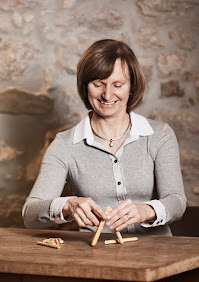 Service here in the Gourmet Stuebli is generally attentive, informative and kind, be it under Martin Bieri's supervision or under the one of his predecessor, Armin Armrein. The latter has now his own restaurant in Davos named Glow, which I also reviewed in a post and mentioned it in my overview of recommended restaurants in the highest town in Europe. When it comes to costs for dining at the Gourmet Stuebli, such gastronomic experiences come at a price. In light of the quality offered and the efforts made here, it is worth the expenditure. As mentioned at the beginning, the glorious times of Martin Bieri as chef de cuisine at Gourmet Stuebli unfortunately came to an end. It is to be hoped that this talented head chef will find a suitable field of action again and that the Gourmet Stuebli remains a foodies’ destination, although with another chef and concept.